“Market conditions are changing. The continued rise in interest rates suggests we are in the early stages of a bond bear market, which could intensify as central banks withdraw liquidity. The receding tide of liquidity will start to reveal more rocks beyond what has been exposed in emerging markets so far, and the value of a value discipline will be in avoiding the biggest capital-destroying rocks. If a rock emerges on the crowded shore of U.S. momentum, it could result in a major liquidity challenge, as momentum is often most intense on the downside as a crowded trade reverses. So investors are facing a large potential trade-off right now: continue to bet on the current dominance of momentum and the S&P 500, or bet on change and take an active value bet in names with attractive value and optionality, but with negative momentum,” said Clearbridge Investments in its market commentary. We aren’t sure whether long-term interest rates will top 5% and value stocks outperform growth, but we follow hedge fund investor letters to understand where the markets and stocks might be going. This article will lay out and discuss the hedge fund and institutional investor sentiment towards United Rentals, Inc. (NYSE:URI). United Rentals, Inc. (NYSE:URI) shares haven’t seen a lot of action during the third quarter. Overall, hedge fund sentiment was unchanged. The stock was in 48 hedge funds’ portfolios at the end of the fourth quarter of 2018. The level and the change in hedge fund popularity aren’t the only variables you need to analyze to decipher hedge funds’ perspectives. A stock may witness a boost in popularity but it may still be less popular than similarly priced stocks. That’s why at the end of this article we will examine companies such as Torchmark Corporation (NYSE:TMK), Dropbox, Inc. (NASDAQ:DBX), and Nielsen Holdings plc (NYSE:NLSN) to gather more data points. In the eyes of most traders, hedge funds are seen as underperforming, outdated investment tools of the past. While there are over 8000 funds with their doors open at present, Our experts hone in on the masters of this group, approximately 750 funds. 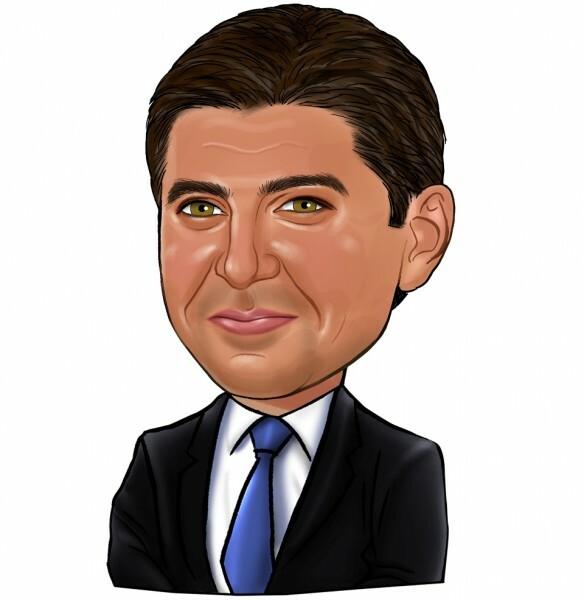 These hedge fund managers preside over the majority of the hedge fund industry’s total capital, and by monitoring their highest performing investments, Insider Monkey has formulated various investment strategies that have historically defeated Mr. Market. Insider Monkey’s flagship hedge fund strategy outpaced the S&P 500 index by nearly 5 percentage points a year since its inception in May 2014 through early November 2018. We were able to generate large returns even by identifying short candidates. Our portfolio of short stocks lost 27.5% since February 2017 (through March 12th) even though the market was up nearly 25% during the same period. We just shared a list of 6 short targets in our latest quarterly update and they are already down an average of 6% in less than a month. We’re going to analyze the new hedge fund action regarding United Rentals, Inc. (NYSE:URI). At the end of the fourth quarter, a total of 48 of the hedge funds tracked by Insider Monkey were long this stock, a change of 0% from the previous quarter. 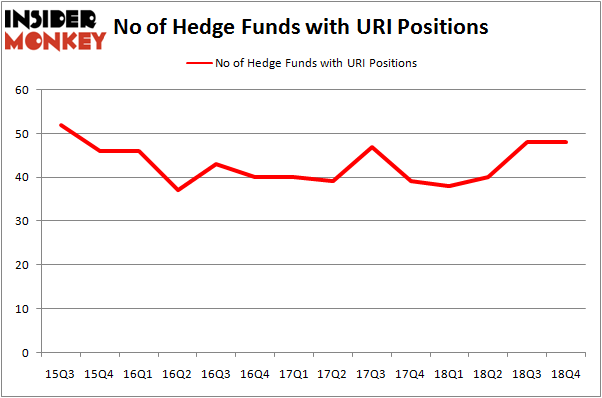 On the other hand, there were a total of 38 hedge funds with a bullish position in URI a year ago. With the smart money’s capital changing hands, there exists a few noteworthy hedge fund managers who were boosting their stakes substantially (or already accumulated large positions). Among these funds, Citadel Investment Group held the most valuable stake in United Rentals, Inc. (NYSE:URI), which was worth $73.4 million at the end of the third quarter. On the second spot was Anchor Bolt Capital which amassed $60.9 million worth of shares. Moreover, Bridgewater Associates, Masters Capital Management, and Adage Capital Management were also bullish on United Rentals, Inc. (NYSE:URI), allocating a large percentage of their portfolios to this stock. Judging by the fact that United Rentals, Inc. (NYSE:URI) has faced a decline in interest from the entirety of the hedge funds we track, it’s safe to say that there lies a certain “tier” of hedge funds that slashed their entire stakes by the end of the third quarter. It’s worth mentioning that Zach Schreiber’s Point State Capital sold off the largest investment of all the hedgies followed by Insider Monkey, valued at an estimated $169.5 million in stock. Kevin D. Eng’s fund, Columbus Hill Capital Management, also said goodbye to its stock, about $74.9 million worth. These transactions are important to note, as aggregate hedge fund interest stayed the same (this is a bearish signal in our experience). Let’s now take a look at hedge fund activity in other stocks similar to United Rentals, Inc. (NYSE:URI). We will take a look at Torchmark Corporation (NYSE:TMK), Dropbox, Inc. (NASDAQ:DBX), Nielsen Holdings plc (NYSE:NLSN), and DENTSPLY SIRONA Inc. (NASDAQ:XRAY). This group of stocks’ market values are similar to URI’s market value. As you can see these stocks had an average of 29 hedge funds with bullish positions and the average amount invested in these stocks was $941 million. That figure was $714 million in URI’s case. Dropbox, Inc. (NASDAQ:DBX) is the most popular stock in this table. On the other hand Torchmark Corporation (NYSE:TMK) is the least popular one with only 19 bullish hedge fund positions. Compared to these stocks United Rentals, Inc. (NYSE:URI) is more popular among hedge funds. Considering that hedge funds are fond of this stock in relation to its market cap peers, it may be a good idea to analyze it in detail and potentially include it in your portfolio. Our calculations showed that top 15 most popular stocks among hedge funds returned 19.7% through March 15th and outperformed the S&P 500 ETF (SPY) by 6.6 percentage points. Hedge funds were also right about betting on URI, though not to the same extent, as the stock returned 17.1% and outperformed the market as well.